Our luxury ballpoint wooden pens (also known as biro pens) are all hand-turned in Northern Ireland, using both local and exotic materials. 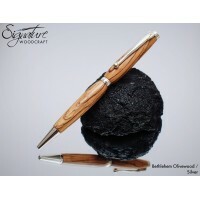 Our ballpoint wooden pens are custom made to your requirements and are ideal for birthday gifts, retirement gifts, wedding gifts, thank-you gifts etc. We have both slimline pens and thicker body pens, and the shape of the body can be further customised to suit. Ballpoint pens are the industry standard pen, and are similar to roller ball pens, except that the ink is thicker. This allows more control and a longer life. They are a very convenient pen and take very little maintenance, simply replace the refill when it runs out. 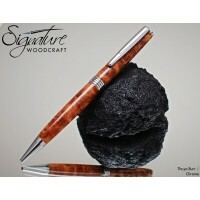 Our stunning Cirrus Ballpoint Pen is a hand-crafted pen featuring contemporary design. The pen.. Folk who love our wee country, both north and south, will truly appreciate this very special pen.&nb..
An original, gun themed pen, with an irresistible Bolt Action. A highly detailed pen, featurin.. This pen has been inspired by the Bible verse 1 Corinthians 13v13, and features the key words Faith,..
A truly stunning Steampunk themed pen. The Fusion is a combination of Victorian science fictio.. The perfect gift for every car enthusiast, with strong automotive themes throughout! The uniqu..
Gracilis is the latin word for slender. This pen is a variation of our Scribe pen. It fe.. If you've ever been stuck without a pen, this little gadget might just be what you need! Its a.. 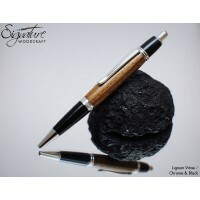 The Mirage has distinctive, beautiful contours that set it apart from any other ballpoint pen. 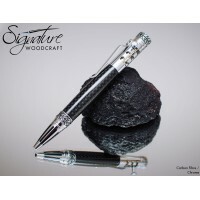 ..
Having a career in ship design and construction, I've wanted to create a ship themed pen since the s..
An incredibly eye catching handmade ballpoint pen, with meticulous attention to detail. Knurle.. 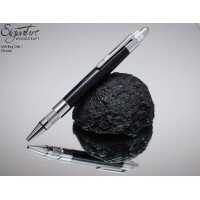 Durable and attractive, the Scribe Ballpoint is a firm favourite. Simple yet elegant, lightwei.. 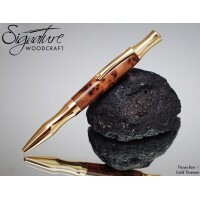 The Sirocco is a firm Signature Woodcraft favourite. 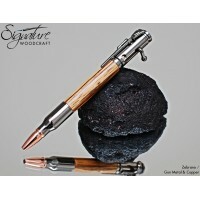 A well balanced pen sculpted from a singl..